I love a lot of things about this first bathroom. Not to play favorites but this is 100% my favorite one. The free-standing sink, the non-standard mirror, the magazine rack. (Who actually reads in the bathroom though?) Anyway, I'm sure it would all look just as great if the walls weren't papered. However, the subtle patterning and neutral tones of the paper naturally add character, but without looking too "busy". I think that the clean lines certainly keep the room from look too eclectic, since the wood colors and the metallics are so varied. It's easiest to see the effect of the wallpaper in this second example because it's such a regular bathroom otherwise. 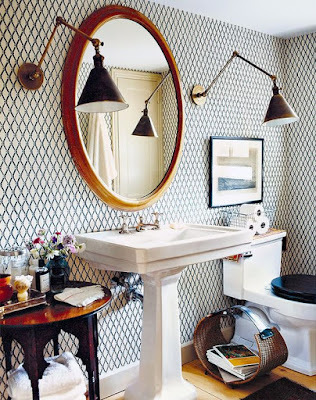 Aside from the mirror, which is also easily replaced, the biggest element at play is the wall pattern. Add some art to the walls and you've got yourself a designer bath! For a long time I wasn't sure if I completely liked this one. I thought maybe it was a bit much. However, I imagined myself walking into it and thought: "Yeah I'd probably react quite happily to the colors actually." So maybe it's not the impact that you want for your master bath, but as I mentioned previously, a guest bath maybe? It definitely could be cool either way, especially if the rest of your home is just as dramatic. 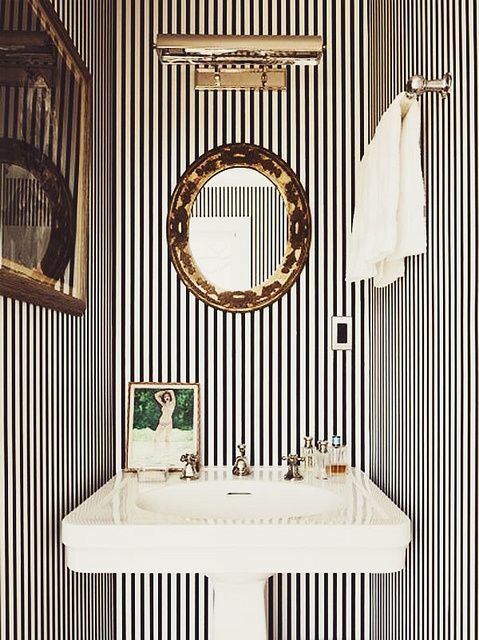 Last but not least, this confusing little bathroom with dizzying black & white stripes. I obviously love the non-conventional mirror and the stand alone sink (theme anyone?). 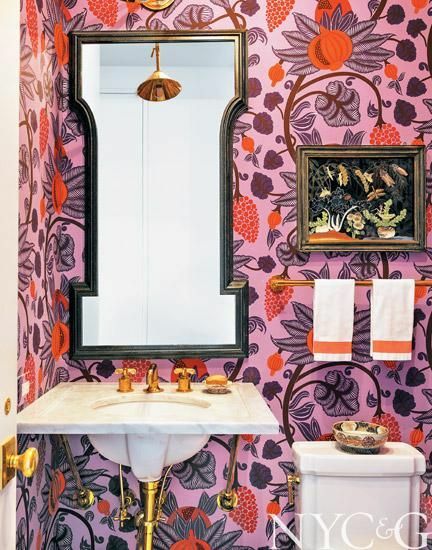 The wallpaper also quite noticeably adds a lot of dimension to the space. This specific scale of stripes is a little difficult to look at but I think the idea itself of adding height to a tiny room through vertical focus is important. Choosing a wallpaper however, that matches the attitude you want to achieve in your space is the most important thing I think. It can change a whole room, as in the case of small bathrooms or small rooms in general. I think that they achieve a specific kind of personality and aura that can't be done through other means. Anyway, that's my spiel on wallpapering your bathroom. 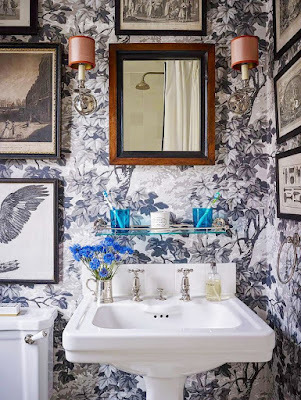 I'm a little obsessed, although also conflicted because I tend to think of an ideal bathroom as a serene space, with little clutter and only small instances of color. Non-beach themed pieces of art or small plants come to mind, which I've written about before. 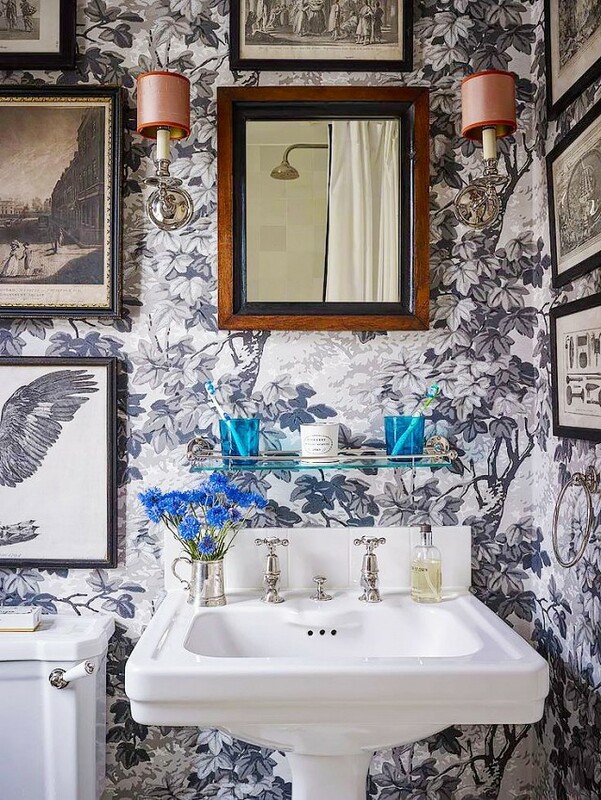 I think that overall it also depends on what the bare bones of your bathroom looks like, and whether wallpaper would ultimately add more than it would detract from the serenity. I don't know, maybe a little glamour is better than a little zen.